This lesson provides guidance for operational forecasters needing to combine different intensity methods to determine the intensity of a tropical cyclone. Each of the intensity methods is summarized, focusing on both strengths and weaknesses. These methods include the Dvorak technique, surface observations, scatterometry, the Advanced Dvorak Technique (ADT), microwave sounders (AMSU), SATCON, and subjective interpretation of passive microwave patterns. Consideration of the previous intensity estimate and forecast is also examined. Three case studies task the learner with combining the various methods to derive appropriate intensity estimates and a final quiz tests learner knowledge to demonstrate successful completion of the lesson. Excellent training on TC intensity determination. Enjoyed it. The lesson is well structured and comprehensive and detailed on most techniques used in determining TC intensities. Recommended for refresher courses for all meteorologists. Very good review of the techniques for intensity estimates. At a minimum worth taking as a refresher for anyone sitting at a tropical forecasting desk. 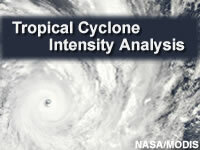 Excellent learning resource or refresher prior to cyclone season on intensity analysis. The summary resource will also be very useful while forecasting. Combines almost everything you need to know about tropical cyclone instensity forecasting in a timely and efficient way that by the end of the lesson enough information has been learned/gained to be confident in future forecasting. A very good module for anyone that has a passion for severe weather. This module is great! and timely for the 2014 NH season. For those of us not involved in making these estimates but who read every word of the TC discussions, it's enlightening to see the thought process behind reconciling the apparently conflicting estimates which are available. Describe the intensity of a circulation and how it is estimated. Combine and utilize the different intensity methods to determine the intensity of a tropical circulation in a range of situations. November 2015: The lesson was updated to include information about RapidScat, which was launched on 20 September 20, 2014, for deployment aboard the International Space Station.